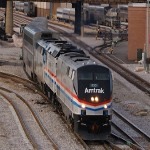 I was in the Chicago area Friday, riding trains on the Metra North Central and Northwest Lines. I had my radio on and heard operators at Lake St., CY, Duval (although the tower is gone, there's still a one-story shack there), A2, A5 and B12. I know too that Dolton and Rondout are still open. What are some others? Add UD in Joliet, JD in West Chicago, and 16th Street south of LaSalle. Calumet, over in East Chicago, just closed down a month or so ago. Parts of the interlocker were removed to be incorporated into the restoration of Grasselli Tower at the Hoosier Valley RR Museum in Indiana (which used to sit just a mile away from Calumet). Hick tower still stands near Indiana Harbor but it's interlocker control was removed over a year ago (now it's just a bridge tower). Several other bridge operator towers remain in service, but no other interlockers come right to mind. It's too bad about that fire at Deval, that was a cool looking tower. Where is CY Tower? Any photos? I think are all still open. Several other closed towers still continue RR signalling or relay equipment and therefore still stand but are unstaffed. I'd be curious to know any updates, omissions, or corrections to this list! Blue Island should have closed here within the past week or so. I forgot about Joliet and West Chicago. I think Kensington's closed but still houses relay equipment for the plant. CY is where the UP North and Northwest Lines split apart. That is the Kennedy Expressway in the background of that photo. THIS IS MY 800TH POST. Blue Island closed at 0800 on 6/8/13. B12 is not an open tower. It's remote controlled by the Metra dispatcher, who handles the interlocking under the supervision of the CP Elgin dispatcher. Even a stopped clock is right twice a day!! UD is supposed to close upon completion of the new Joliet station. In addition to Blue Island Tower closing, the gate tower is also closed, as CSX converted the grade crossing over to a automated one. Tower B-17 is supposedly supposed to close in Bensenville once the project to grade separate Irving Park Rd from the CP north of the junction is closed. JB and Rondout are safe for now, however Dolton is supposed to close by the end of the year from what I've heard. Kensington hasn't been manned for several years. You can cross Dolton off the list of active towers as of Sunday 2/26/17. Typhoon wrote: You can cross Dolton off the list of active towers as of Sunday 2/26/17. I think there are still bridge tenders at the CSX bridge on the St. Charles Airline and at Hick, but whether or not they line up any trains, I don't know. Oh wow i never will forget the time back in May of 1995 when Ralph the tower operator up in the tower yelled for me to come up in Dolton tower to throw the levers for him i remember him telling me in rapid succession the lever numbers to throw what an awesome experience he let me take pictures up in the tower also. I will have to find them and post. Sorry to see it go. Hopefully it's at least still standing when the mom and I hit Chicago next year. Still a bridge tender at Hick but that's it. Add the Metra Blue Island tower to the still open list! Was there to yesterday. Signals were being cut-over, and trains talked by the signals through Dolton. Maintainers everywhere working on switching everything over. Dolton was an IHB tower, should be the IHB East dispatcher. There was rumor at one time of adding a Middle dispatcher on IHB to handle the workload when Dolton closed. Haven't seen that to be true. I can Confirm that Dolton is controlled by the IHB East Dispatcher, I was over there last week with the scanner listening as UP trains called IHB East for signals across the csx and IHB tracks.